Two Man Rule Systems are custom designed by Kouba Systems. Please contact us with your project details so that we can assist you in designing a system to meet your project requirements. The MCIO board is a microprocessor based circuit with 8 fully supervised, field selectable N/O or N/C inputs with YELLOW supervision status & RED point status LED's; 12 signal level relays or optional 4 Amp solid state relay outputs, all outputs have GREEN relay status LED's; 4 field adjustable time delays; a RS485 serial communications port; and an 8 bit dip switch to be used for serial addressing or function selection. It can be operated as an intelligent control unit in a stand alone configuration, or as an I/O device receiving its control from a larger control system via the RS485 port. The Emergency Haven is a pre-integrated, standalone, small steel building designed for use in locations where an individual's immediate protection in an emergency situation is required. Typical locations include: remote parking lots, parking garages, roadside rest stops, public parks, un-patrolled public areas, and corporate, college, and school campuses. 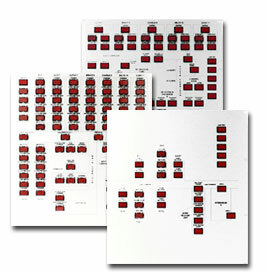 Custom panels can be produced with a variety of buttons, switches, and finishes. 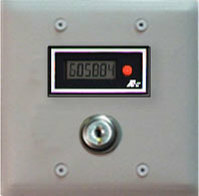 Add key switches, locking enclosures, back boxes, and custom graphics to create the panel that fits your project. A few examples are shown here. Contact us for more information. Our pedestrian counting system, the LDA-CTR, tracks entries/exits and computes the current occupancy levels of a room or building. The units are easy to install and simple to use. Units may be doorway-mounted or free-standing, and the free-standing units can be used as either portable or permanent systems. 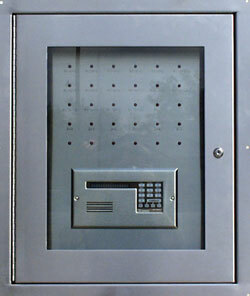 Several pedestrian counters can also be linked together to provide a single counter output for multiple doors.